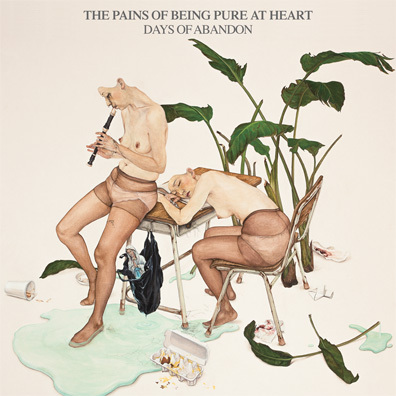 Brooklyn's Pains of Being Pure at Heart, the pop vehicle for songwriter Kip Berman and a rotating circle of musician-friends, continues to shift and contort its sound three albums deep into its discography. The first album reflected the group's early, intimate approach with its small-scale bedroom tape sound. Then Belong came along, and everything got bigger: the guitars took on a heavier crunch, and the massive synths held back only enough to keep from swallowing up Berman's feather-light vocals. This latest record features yet another evolution for the band, with new members and a slightly different vibe, but is once again centered by Berman's infectious pop songcraft. Of the fresh faces in Pains, new singer Jen Goma (from A Sunny Day in Glasgow) is the most prominent. Her voice adds its own distinctive flavor when it pops in to the mix, and she even provides lead vocals on two songs: "Kelly" (which could almost pass for Eat to the Beat-era Blondie) and "Life After Life" (which sounds a little bit like an Isobel Campbell-fronted Belle & Sebastian song, partly in thanks to the soft horn arrangements by Beirut's Kelly Pratt).